Head coach of the Super Eagles, Gernot Rohr, has insisted that his squad for the 2018 World Cup is not complete yet. 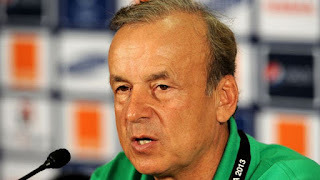 Rohr was reacting to statements credited to the team’s chief scout, Victor Agali, who claimed the coach already knows the players he will be taking to Russia next year. Agali stated that the German is not really searching for new players, as he plans to build and prosecute the 2018 World Cup with the players presently in the team. But Rohr, in an interview with OwnGoalNigeria, made it clear that the door is still open and indicated Wolfsburg striker, Victor Osimhen, is still in his plans. “We have friendly games lined up next year to try some new players in our team, and also give opportunity to some players who are with us but are yet to be tested.